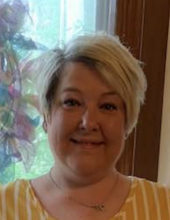 Dusty Lynn Dunning, 41, of Elkton, Kentucky died at 4:10 p.m. Friday, January 25, 2019 at her home in Elkton. Services have been postponed. Please check back for details. A native of Wood River, Illinois, she was born June 26, 1977, the daughter of Daniel T. Hodge, Sr. and Donna J. Dunning Hodge who survive. She was a Major and Deputy Jailer at Todd County Detention Center and was of the Baptist faith. Survivors include her parents: Daniel T. Hodge, Sr. and Donna J. Hodge of Hopkinsville, KY; her significant other, Greg Allen of Elkton, KY; her brothers, Daniel T. (Angela) Hodge, Jr. of Hopkinsville, KY, Jamie A. Hodge of Hopkinsville, KY; eight nieces, three nephews and her dogs, Texie, Pepper, Martha Stewart and Gizmo. To plant a tree in memory of Dusty Lynn Dunning, please visit our Tribute Store. "Email Address" would like to share the life celebration of Dusty Lynn Dunning. Click on the "link" to go to share a favorite memory or leave a condolence message for the family.